Jem Edwards played at the legendary Stonehenge 1976-78, Glastonbury 1977 and Rivington Pike 1977 free festivals. He was a roadie on Motorheads’ first tour with Hawkwind in 1976. From 1979 to 1981 he lent his talents to London’s Wessex Studios working alongside Master engineer Jeremy Greene, remixing for the likes of The Damned and The Theatre of Hate and ripped up the Bussendorfe with Jeremy on guitar on the duos lost tapes sessions. In 1978 he met Patron of the Arts Fred Koch who commissioned ensemble and orchestral pieces through The Arthur Foundation NY and The New York Arts Foundation, enabling him to manuscript solo, ensemble and orchestral pieces (presently being recorded by John Thompson of Penzance and soon to be released ‘Speculations for Piano’) and made the move to London. Between 1978 and 1984 he graced the bandstands in London where he delivered his uncompromising and avant-guard piano playing (Almeida Theatre Bar/Ivories,Bass Clef ). In 1983 Jem and Fred initiated the benefaction of the Swan Theatre, a gift to the people of Stratford and the Royal Shakespeare Company in Stratford-upon-Avon. In the early 80’s Jem played with Paper House, a Post Punk New Wave outfit based in North London, performing regular gigs at the Brixton Archway Studios behind the now sadly defunct Desmond’s Hip City record store on the Railton Road, with jazz percussionist Andy Leopard, Oxford Music Collectives performance of Terry Riley’s “In C”, The Abstracts (Mark Gibbons), Void Litter with Simon Gilbert (Suede), Jerry Bewley (Oxo, Entropy, Kangaroo Moon, The Egg) and Chris Pinder (Oxo,Pinder),Ed Alleyne-Johnson (New Model Army) recording one EP with David Brown of Limit Mobile Audio where he first recorded ‘Continuum for piano and digital delay’. When Fela Kuti was jailed for 5 years in 1981 after carrying $50,000 US out of Nigeria, the band was left in London without a keyboard player, Jem stepped up on keys and the band Blue was born. From 1996 to 1999 he played keys with London R & B unit The Fireflies. A key organiser in Birmingham’s first Fireworks Fantasia (1991) Jem’s band The Eagles Gift performed to an audience of over a million. He was active at that time with reeds and woodwind player Martin Robinson, (Simon Fell and the Frakture Big Band, Mamadou and the Super Libidor Band) playing Irish sets, free improvisations and general lunacy on a variety of bandstands ranging from Birmingham Conservatoire to Westminster Cathedral. He formed a song writing partnership with Craig Hammond, recording several solo efforts playing all instruments himself, a skill he eventually found an outlet for in DINKUM BOHOS which incorporates flamenco guitar, steel string, spanish, lap steel, electric guitars along with vibraphone, piano,keyboards, drum kit, percussion and vocals. Around 1990 he met John Thomson the concert piano player and improviser and worked for two years on structured improvisations for two pianos/four hands performing around Warwickshire and initiating the first public performances of some of his series of manuscripted piano works called Speculations. John Thomson is an established concert pianist who trained at the Royal Academy of Music and continued his training at the Budapest Academy. Now living in Penzance Cornwall UK, they met up in 2011 and began preliminary talks on the recording of all 14 pieces which have been re-edited over the years and a new cycle of piano works. Whilst with the Royal Shakespeare Company in the 90’s, The Summer House installation (originally installed at The Serpentine, London) rigged outside the old Main House, hosted a variety of international acts during the 2001 season. The Summer House Productions were created by Jem and legendary sound man Tim McCormick, former Deputy Head of sound at the Royal Exchange Theatre in Manchester(Klark Teknik, RSC,Cowboy Junkies). He performed with Dave Carroll (Steve Gibbons Band) in the award winning 2004 Spanish Season as part of the RSC’s special events team working with Fiona Lindsay (Face to Face at the Arts). 2003 saw the formation the acoustic blues jam unit 6 O’clock Shadow with Richie Storry and Oli Bigland playing with guest artists such as Greg Hicks (RSC) and Damien Kearney( The Wind that Shakes the Barley). He recorded at Andy Bird’s Darkstone Studios in Warwickshire with Richie and made solo recordings at Windmill Studios, Harbury. The band organised several charity musical events with various members of the Royal Shakespeare Company from 2000 – 2005 performing at the Swan Theatre and local venues. He went on to become a freelance theatrical wire rigger for Ragdoll Children’s TV Productions co-designing the rig which flew the Pinkyponk for the award winning In The Night Garden Production working along side cult film director Dirk Campbell (I Bought A Vampire Motorcyle 1990), Tony Wood (Arclight Productions) and Pob. Taking a break from it all, embarking on the surfing trip to Australia in 2007 which saw the temporary end to 6 O’clock Shdaow and inevitably ended up in musician/surfing mecca Byron Bay. 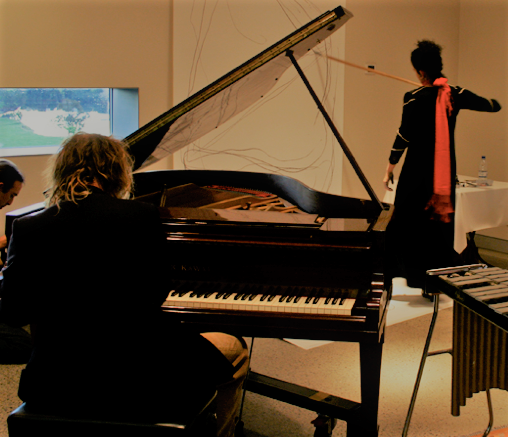 Theatre manager Greg Aitken( Byron Bay International Film Festival) invited him to design a set for a production of Karel Čapek’s play The Life of The Insects, which he happily did in exchange for unlimited time playing their Grade D Steinway Grand Piano. It was during the get-in that he first met VASUDHA HARTE, pianist, composer and Musical Director of the show. He was to later discover her songwriting genius and many midnight duets later these two consummate musicians paired up to form a formidable duo playing musique originale in their band DINKUM BOHOS. Dinkum Bohos have journeyed to the UK (2011) playing various festivals and events (Rhythm Tree Festival IoW, Buddhafield, Watchet, St.Ives) they released their live CD Sterognostic- live at the Beach Hotel, Byron Bay (available from this website, contact us and https://flamedogrecords.com/shop/products-page/dinkumbohos/stereognostic...). He continues to work on his solo projects, gigs/recording with the DB’s, live improvisations with Daevid Allen (Gong, Soft Machine, University of Errors) and Maxwell Volume ( ThirdSky, Homeostasis,Flamedog Records, Byron Bay) in Australia, Speculations for piano with John Thomson (UK) as well as continuing to forge links with musicians in Brunei, Sabah and Sarawak with Raman Mas (Brunei).